If you are single or a small family living in a big house, chances are you may profit from installing a water meter. This is because in case of fixed payments, the water company uses the rate able value of your house to fix your annual charge. Use this calculator to see if your house will benefit from installing a water meter. Use water saving gadgets like shower heads, water butts, flow regulators to save water. Some of these gadgets may be freely available to you from your water company. Check this site to view water saving freebies offered by your water company. Take showers instead of long baths. Reserve luxurious baths for when you really need them. Showers use only 35 liters of water compared to 80 liters required for the bathtub. Load dishwashers and washing machines to their full capacity. It not only makes them more efficient, it also saves you a second round of washing. Don’t leave the tap on while brushing or shaving. Be conscious to save water throughout the day. Fix dripping taps. These are the biggest source of water wastage and fixing them can save up to 75 liters a day. Check if your plants need watering before turning on the sprinklers. You can hand-water them too using the initial cold water that comes out of the tap or even use water from the fish tank. Today, cisterns come designed to save water. If you have an older model, place a bottle inside it to save water each time you flush. If you have a soak-away that lets rainwater absorb into the ground instead of running into the sewer, then you can ask for removal of your surface water drainage charges. If you have a septic tank in your property, you can request for removal of sewerage charges. This can save you £200 a year. Invest in water efficient bathroom fittings and home appliances. While cooking and washing by hand, use only as much water as required. With UK on the brink of a water crisis, we have a responsibility to save water wherever and whenever we can. 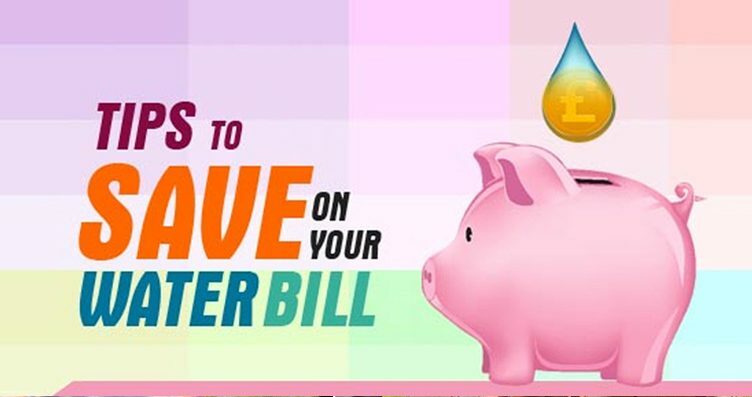 Use the above tips to conserve water and save money.